911 Restoration New Orleans offers the most professional water damage restoration services available 24/7/365 to aid homeowners as soon as floods occur. Water leaks are serious issues that need to be handled by our water damage New Orleans crew to ensure mold growth and other subsequent problems do not occur. We are licensed, insured, and bonded with the latest drying technology to offer the most comprehensive water, mold, and odor removal. Beyond moisture clean up, we can also help with fire damage restoration, fungus remediation, and more property disaster repairs. We are a well-rounded company here to ensure your safe recovery after disaster strikes your home. If your office park, residence, or any other location you love is already underwater, then contact our water damage restoration New Orleans experts with 911 Restoration New Orleans for immediate relief and repairs today! 911 Restoration’s forte is water damage restoration New Orleans services. We have years of experience and a real passion for the work. Trim the trees around your home to eliminate the chances of dead branches impaling your roof and bringing in water. Make sure to check the pipes around your property for rusting or corrosion that may indicate a section in need of being replaced. Eliminate the debris and leaf matter from your gutters to avoid overflows that can ruin your attic. Never forget to inspect the hoses and fittings on your appliances that are connected to the water line as these can fail. We know how to repair your home after the worst floods and how to deal with your insurance company to get you the biggest return. When it comes to water extraction, a thorough cleanup is essential. Without professional treatment and industrial grade equipment, the left over moisture will breed mold and further weaken the home’s structure. If your home is already dealing with the effects of a liquid invasion of any kind, then contact our water damage restoration New Orleans team with 911 Restoration New Orleans for the best in the industry today! Mold is a fungus made of floating spores that settle anywhere an excess amount of water exists. 911 Restoration has the proper equipment to find these spots. 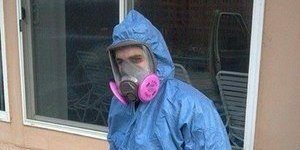 Our mold removal team is prepared to offer you the best mold remediation techniques to make your property safe again. Mold spores float through the air and find their way into the respiratory system of a home’s inhabitants. Once you have ingested these spores, breathing issues abound. With a response time of within 45 minutes 911 1 Restoration and our water damage New Orleans staff will be at your home offering a free visual inspection as soon as you need us. Call our mold removal New Orleans team with 911 Restoration New Orleans to schedule your mold appointment and start breathing easier today! Beyond mold, our water damage New Orleans operatives are capable of odor removal and sanitation after a black water spill from a toilet overflow or drain clog. Turn off your water main. This type of disaster happens much more than people believe. Flushing items like wipes or paper towels is all it take to flood your home with category 3, toxic water. 911 Restoration New Orleans uses full hazmat gear to protect our crews from the health risks associated with this type of caustic situation. Turning off your water main ceases the flow of water. Staying away from the environment should prevent the spreading of disease. Calling us is the only way to bring in fast professional help. No matter what type of disaster plagues your home, our sewage backup cleanup New Orleans team with 911 Restoration New Orleans will be there quick to remedy it in no time, so call us today! Fire damage includes a plethora of other challenges. Beyond soot stains and smoke odors that can last years, there is a hefty amount of water damage and potential mold issues after a fire. Because firefighters typically put out flames with a heavy blast of water, these elements go hand in hand. This is a compounded problem for your home’s structure because the fire exposes the vulnerable portions of your home and the water saturates it, reducing the integrity and increasing the chances of collapse. As soon as the fire department leaves your home call the fire and smoke damage restoration New Orleans experts with 911 Restoration New Orleans for immediate assistance to get your home back on track today! 911 Restoration has been a part of New Orleans natural disaster history. When Hurricane Katrina splashed ashore, 911 Restoration was a small company based in Los Angeles. Seeing the damage inflicted by the storm registered with us and we knew we could help, so we packed our trucks and headed out. We saw the devastation plainly, but with our fellow restoration companies, we also saw a bright future, a fresh start. Our water damage crew got to immediate work cleaning the city and restoring families. We did everything we could to restore peace of mind to the area. It took dedication and hard work, but in the time of need we banded together with the community to return New Orleans to the grandiose city it had once been. Today, 911 Restoration is a nationwide franchise owned and operated by locals in their chosen community. We know what each type of disaster needs to be completely remedied. When your property endures the brunt of a disaster, call our disaster restoration New Orleans professionals with 911 Restoration New Orleans for same day service today!